The Wild Earth Barn is a cosy chalet in a magnificent mountain setting, with uninterrupted views of the Wilkin Valley, Mt Aeolus glacier and the Mt Aspiring National Park. It's a particularly restful place to stay. The Barn is a self contained dwelling as part of our lodge. Wild Earth Lodge is a rammed earth home where we live and offer guests a unique wilderness experience. 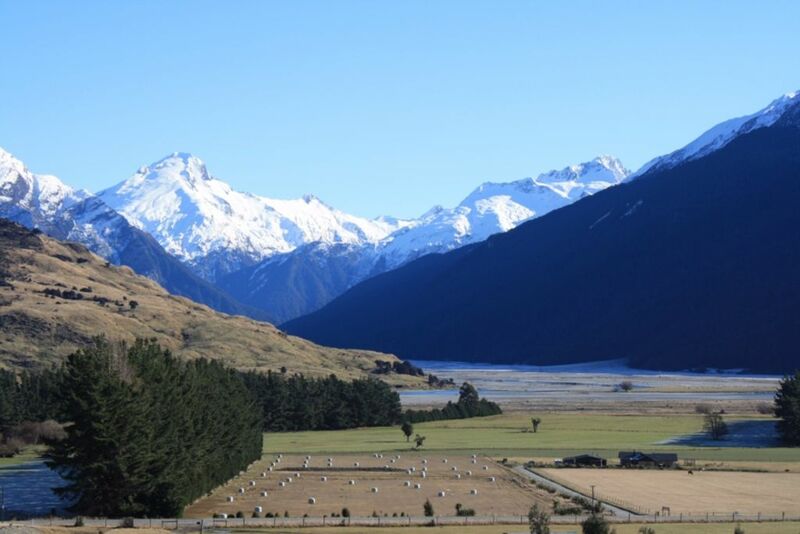 The property sits between two high country sheep stations in the Wilkin Valley, Makarora. Makarora is a small township with a cafe, authentic local pub and DOC centre. The Barn has easy access to the rivers and is 5 minutes from the boat ramp at the head of Lake Wanaka. The drive to Haast takes 1 hour and we are 40 minutes from Wanaka township. The fishing is great here and the rivers are open for reel or fly fishing between November and April. A heli guided fishing trip is an incredible day! The Mt Aspiring National Park has many beautiful walks and great hut facilities. Day walks to 4 day overnight tramps are all on our doorstep. In winter Cardrona and Treble Cone Ski fields are 70 minute drive from our gate to the car parks. We are happy to help you plan any activities or adventures such as jet boating, heli sightseeing, guided fishing or hunting, even a ride in a classic Shelby Cobra! There are two other rooms available in the lodge (1 King Bed, 1 Queen Bed) each with a bathroom if you require more room. Great wide views up the valley to the mountains from our comfortable, well appointed, rustic accommodation. Lots of nice touches to be found In the kitchen and everything we needed including Pete's offer to light our wood burner fire. Comfortable beds and loads of hot water. A perfect overnight stop on the way north from Wanaka. Wonderful view. Comfortable living space. Remote location so you can really enjoy the stars at night. Will come back again. Awesome place to stay, would happily return at any point! The stunning view of the ranges and the nearby river across the fields dominated our beautiful mornings and relaxing evenings. Just far enough from everywhere to be peacefully calm and close enough to wherever we wanted to go, it was the perfect place to stay. The barn was in a stunning location and very well equipped. The barn was in a stunning location and very well equipped. Great for kids - a large trampoline, animals to observe/pet, big outdoor space including a lovely garden nook, walk to river. We did have a serious mouse problem, however (caught 6 within 24 hours with just two traps), and that affected our enjoyment (mouse droppings all through suitcases and clothing etc). Pete was relaxed about it and surprised by our dislike of mice/droppings. Small discount given which was appreciated. Great place to stay amazing views and great hosts. Great place to stay amazing views and great hosts. Will be back!